Royal Caribbean Cruises would guarantee Miami-Dade County more than $140 million in dockage fees for its present cruise terminal at PortMiami for the next ten years – more than $100 million above the present guarantee for that period – in a contract amendment before county commissioners this week. The amendment, which did not get the normal county committee review, is distinct from an agreement also before the commission this week for the cruise line to build and operate a 10-acre cruise ship terminal elsewhere on the port. The existing agreement for the present terminal space dedicated to Royal Caribbean, Terminal G, was to expire Sept. 30, 2021. The amendment before commissioners now would extend an agreement to Sept. 30, 2026. During that period, the cruise line would pay the county from $10.5 million in fiscal 2016 to $14.8 million in fiscal 2016. That payment guarantee, says a memo to commissioners prepared by Deputy Mayor Jack Osterholt, “is equivalent to a minimum passenger guarantee of 600,000 passenger moves through Terminal G each fiscal year,” up from the current 325,000 guarantee. Because each passenger normally departs and returns to PortMiami, 600,000 passenger moves equates to 300,000 passengers. The amendment would provide for one five-year renewal period starting in 2026, based on mutual agreement. The county would be guaranteed $100 million from Royal Caribbean over that five-year renewal period, based on an annual guarantee of 750,000 passenger moves. •A parking incentive, unchanged from the current deal between the county and the cruise line. That payment is based on the cruise line’s share of paid parking at the seaport and would amount to about $1.6 million a year payment to the line now and about $2 million a year if the option of a renewal after 2026 is exercised. •A marketing incentive based on passenger thresholds. Carnival Corp., the port’s largest tenant, already receives such an incentive, but Royal Caribbean has not gotten one. Under the amendment before commissioners, incentives would start Oct. 1, 2017, ranging between $292,000 and $370,000 per year, based on passenger moves. Marketing incentives would rise markedly to $622,000 to $700,000 per year in a renewed contract in 2026 based on a 750,000-moves guarantee. The two incentives mean that the county would pay Royal Caribbean almost $2 million a year while the line is paying the county $10.5 million to use the terminal. The marketing incentives are to be used by Royal Caribbean to offset its commitment of $1 million annually toward a marketing campaign to increase tourism for ships berthed at the port. Royal Caribbean Cruises Ltd. is the world’s second-largest cruise brand. Like the larger Carnival Corp., Royal Caribbean is headquartered in Miami. But it has berthed its largest ships at Port Everglades, not PortMiami, because Miami’s seaport could not accommodate their size. The construction by the line of its own terminal, Terminal A, would bring those ships to Miami too. 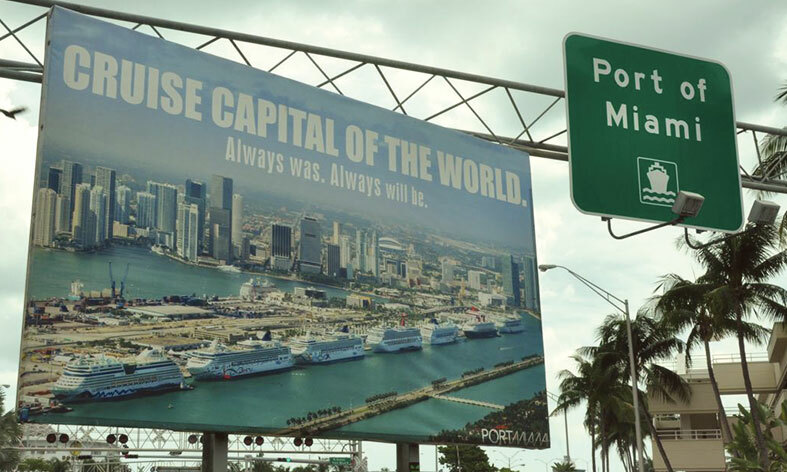 The line does homeport vessels of three of its brands at PortMiami: Royal Caribbean International, Celebrity Cruises and Amazara Club Cruises. This month, Enchantment of the Seas and Empress of the Seas are to sail from PortMiami. Those same two ships are to sail from the port in August and September as well, and will be joined by Grandeur of the Seas on Oct. 26. By November, the company will have six cruise ships sailing from the port as the winter season cruise traffic builds. The new 170,000-square-foot terminal that would be part of a separate contract coming before county commissioners this week would be home port to a 5,400-passenger Oasis-class ship, the world’s largest, and other Royal Caribbean vessels. Royal Caribbean has 46 total ships in its fleet and 10 under order, Mr. Osterholt’s memo told commissioners. The line has been at PortMiami more than 45 years. It now accounts for about 15% of the port’s traffic and is anticipated to account for more than 30% when the new terminal enters service.